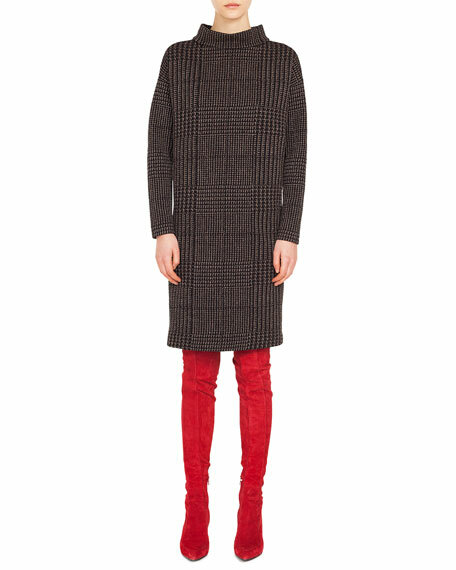 Saint Laurent Swiss dot dress. Akris punto dress in houndstooth metallic jacquard. Wide turtle neckline. Long sleeves. Side seam, zip pockets. Shift silhouette. Hidden back zip. Knee-length. Cotton/nylon/polyester. Lining, viscose. Imported. Exclusively ours. Badgley Mischka Collection laser-cut wave cocktail dress with metallic edges. Jewel neckline. Long sleeves. Shift silhouette. Knee-length. Straight hem. Exposed back zip. Polyester. Imported. 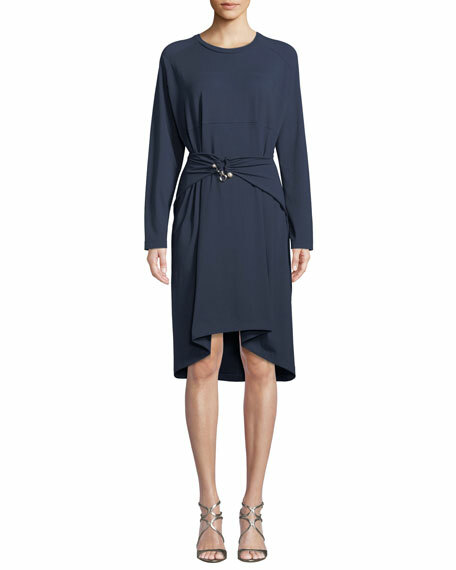 Carven dress in cotton jersey. Crew neckline. Long sleeves. Belted waist; silvertone clasp. Shift silhouette. Knee length. Slipover style. Cotton/spandex. Machine wash. Imported. Lafayette 148 New York "Roslin" dress in classic velvet. Round neckline. Long, bell sleeves. Shift silhouette. Hidden back zip. Knee-length. Rayon/silk. Lining, polyester. Dry clean only. Imported.